An individual's Asset Allocation needs to ensure that the most important and most basic needs of his family are taken care of in the most secure manner. And what better way to do this than invoke the hierarchy of needs theory by the famous psychologist Abraham Maslow? People familiar with his work would know that his need hierarchy pyramid ensures that our most basic needs are given topmost priority. In other words, we will have to walk the readers through different asset classes and talk about the importance they hold in terms of not only meeting basic needs but also preserve wealth during the troubled times we could be in for. Cash - Everyone has their monthly expenses. This includes basics like food, travel, clothing, housing, etc. Excluding expenses on luxury, it would be a good idea to work out how much you need each month. At any point of time, it is necessary to put at least 9-12 months of necessary expenses in savings. These should ideally be completely risk free and easy to get. A savings bank account or short term fixed deposits are usually good places to park these savings. But here one may ask, with expenses going up almost daily, how does one set aside this huge quantum of savings? Well the idea is no different from what economists and experts prescribe for the countries. You have to adopt austerity measures. Prioritize your expenses and cut back on anything and everything that you may regard as unnecessary and wasteful. True it would mean that you live in a frugal manner for sometime but at the end if you are able to build up more funds, then the whole process is totally worth it. Initially it may seem difficult but saving at least 2 -3 months of expenses is doable to start with. As you move higher in life and continue following these rules in a disciplined manner, even the 9-12 months' savings become achievable. It also a good idea to keep cash in hand to buy good bargain stocks in the event of a market collapse. As such investors could keep about 10 to 40% of their portfolios in cash. The lower limit would be touched when markets crash and good bargain stocks are available at cheap valuations. The reverse would happen at the time of market euphoria. Important point to note here is that this cash is over and above the cash that has been set aside to meet contingency expenses. Gold - The broad economic scenario is not good. And based on what you have read till now, things are not expected to get any better either. Therefore every astute investor needs something that will insure his portfolio against all odds. And that something is none other than gold. Gold has been able to hold on to its value through all economic odds and evens. The reason for this - gold is real money. Having at least 5% of your assets in gold will give you that insurance policy that will protect your portfolio when things go bust. For gold is the only asset class that will see its value remain intact when that happens. Property - Property is by far the biggest components of one's total assets. And this in itself underlines its importance we believe. Make no mistake, this asset class has proven to be one of the best in terms of returns generated over a long term horizon. As a consequence, we are in favour of a person having at least one property for each of his children. However at a time when property prices are out of reach of most of us, this is a dream at best. The next best option therefore is to get rid of the loan on one's own property as early as possible. This will ensure that when times turn bad, most of your income does not go towards meeting the EMI expenses on your loan. Clearly, there's no bigger relief than watching the roof on our heads become debt free. Bonds - To protect your wealth against inflation and to earn a fixed rate of return, it is worthwhile having debt instruments in your portfolio. Debt instruments are typically for a fixed tenure and offer a fixed interest (or coupon) rate over this time period. It helps you get the assured returns while taking on lower risk as compared to stocks. But make no mistake, debt instruments are not risk free and do come with their own set of risks. There are safer options like postal savings schemes, liquid funds, etc. However the rates of return in the safer debt instruments may not compensate you for the increase in prices, i.e. inflation. But your capital is relatively safe. Safe stocks - Finally we come to stocks. Not just any stock but safe stocks. These are stocks that have strong fundamentals and capable managements. They have a sustainable moat that can help them weather good times as well as bad. While no stock can offer an absolute guarantee against investment losses, having fundamentally solid and safe stocks can help investors not just protect their capital but also fetch desired risk adjusted returns over the long term. In fact very long term investment planning for children's education, retirement etc. calls for average annual returns in excess of 12-15%, which can be achieved with the help of safe stocks. In fact, investing legend Warren Buffett has achieved returns in the region of 20% per annum for a very long period of time by just by investing in safe stocks. Such stocks can be found in every category of market capitalization - large caps, mid caps and small caps. But the important point to remember here is the risk profile of each category. As your experience will tell you, stock markets tend to be very volatile. And putting too much money in a single stock or sector can be very risky. That is why we recommend our subscribers to have a well-diversified equity portfolio comprising the appropriate proportion of small cap, mid cap and large cap/ blue-chip stocks. 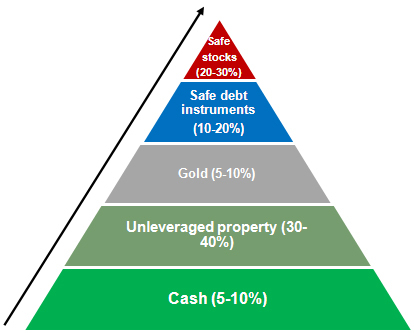 Based on their relative riskiness, we have created an asset allocation pyramid that can help you in deciding how much money you should invest in a stock. However, it must be noted that the allocation levels could differ from person to person depending on the risk appetite. In our view, large cap/ blue-chip stocks are the safest of the lot. Because of their large size, they may not grow as fast as small caps or mid caps. But they are relatively more stable and resilient to negative macroeconomic developments. This keeps them in good stead over the long term and makes them reliable wealth creators. As such, we have assigned them a significantly higher weightage. According to us, large cap/ blue chip stocks should comprise at least 60% of your total equity portfolio. However, a single large cap/ blue-chip should not form more than 5-6% of your total portfolio. Mid cap stocks represent moderate risk profile. Compared to small cap stocks, they are more resilient to adverse market conditions. Moreover, they usually tend to have better liquidity as compared to small caps. However, they are not as safe as large blue-chip stocks. We believe that mid cap stocks should comprise not more than 30% of your total equity portfolio. This means that a single mid cap stock should not form more than 4-5% of your portfolio. Small cap stocks are inherently more risky compared to large blue-chip or mid cap stocks. On the brighter side, they present a huge growth potential. It is not unusual for a good small cap stock to turn a multibagger in a matter of months. But on the flipside, there is a high risk attached. We'll tell you straightaway that not all small cap stocks tend to be outperformers. In fact, we have seen small cap stocks plunging 80-90% when things turn sour. That is the reason small caps are not recommendable to those having a low risk profile. Even for investors having an appetite for slightly more risk, not more than 10% of one's portfolio should be invested in small cap stocks. This means that a single small cap stock should not form more than 2-3% of your portfolio. This will ensure that even if your investment in a particular stock turns out to be a failure, it will not have a very adverse impact on your overall portfolio. Investors would do well to remember that for some of them who are quite risk averse, there may actually be no place for small caps in their portfolio.